Basement Damp Proofing Epsom, Surrey. 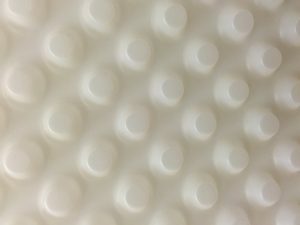 Converting an existing damp, wasted basement, cellar or vault, using studded membranes (above) is fast becoming the most popular and economical way of extending a property, whilst at the same time, increasing the value of your home. Tapco HomeDry are one of London and the Home Counties most established and reputable basement damp proofing companies and are a Delta Membrane approved contractor and member of the Basement Waterproofing Association (BWA). Following instructions from a client in Epsom, our qualified Property Care Association (PCA) surveyor visited the property to inspect and determine the best method of damp proofing two very good sized rooms for use as a cinema room and office. The rooms were surveyed and measured and out detailed specification was submitted, together with images and our floor plan. Our client immediately accepted our proposal and arrangements were made to commence the work. Following some preparation by our fully trained operatives, the walls were made ready by removing wall timbers and bricking up voids, including an old coal chute. A channel was cut around the perimeter of the floor in preparation for a drainage channel and the concrete floor was excavated to install a sump pump chamber. A High Density Polyethylene Membrane (HDPM) was installed to the walls, using ancillary water proof fixings, prior to installing the drainage channel and the larger studded floor membrane, connecting the two with a floor/wall joint. A galvanised metal frame was then installed, prior to dry-lining with insulated plasterboard which was plaster set to a smooth finish. A special pump was then installed and plumbed in, to discharge any incoming water to a place chosen by us. The floor was then finished with a floating, pre-treated, tongue and groove chipboard floor and skirting boards were stuck into place, ready for others to decorate. We have a very happy client, who was delighted with her two new favourite rooms, to enjoy for years to come. She trusted Tapco HomeDry because we are a reputable and established company. Our Basement Damp Proofing is thorough and guaranteed for 2o years and for her piece of mind, it is protected by Guarantee Protection Insurance (GPI). If you are considering converting your damp basement or cellar, never compromise, only ever use a specialist like us, because failure of the system is disruptive and costly.